Sebastian Vettel clinched his ninth pole position of the season ahead of Red Bull team-mate Mark Webber in qualifying for Sunday’s Korean Grand Prix. Red Bull locked out the front row for the fourth time this season, and the eighth for Vettel and Webber as a pairing, with the duo split by just 0.074secs on this occasion. On the second row of the grid at the Korea International Circuit will be Ferrari’s Fernando Alonso and Lewis Hamilton in his McLaren. British former world champion Hamilton, 28 points adrift in the standings and desperately needing a win to stay in the hunt for the title, finished half a second down on Vettel. After completing his first run in Q3, there was a serious scare for the 25-year-old as he made his way into the pit entry. Taking the right-hander too quickly, Hamilton was forced to take to the grass before finally making his way back onto the asphalt and into the pit box for a fresh set of tyres. Whether that unsettled Hamilton is unsure, but he failed to make any headway on his second row, and will now have to rely on his race pace to keep him in the hunt. Mercedes’ Nico Rosberg starts fifth ahead of Felipe Massa in his Ferrari, with Jenson Button suffering another damaging blow to his hopes of retaining his title as he will start seventh. At the end of Q1 Button had complained over the team radio that he was struggling to get temperature into his tyres, explaining why he finished a second down on Hamilton who ended that session quickest. Renault’s Robert Kubica starts eighth, with Michael Schumacher ninth for Mercedes and Williams’ Rubens Barrichello 10th. After clinching a place in the top 10 in three of the previous four races, Nico Hulkenberg failed to make it four from five after being edged out by team-mate Barrichello in the 15-minute Q2. The German will start from 11th ahead of Sauber duo Kamui Kobayashi and Nick Heidfeld, separated by just 0.068secs, with Force India’s Adrian Sutil 14th. Milton Keynes – Mark Webber was ranked only second in Japan. Red Bull star claimed to have been satisfied can secure top spot F1. 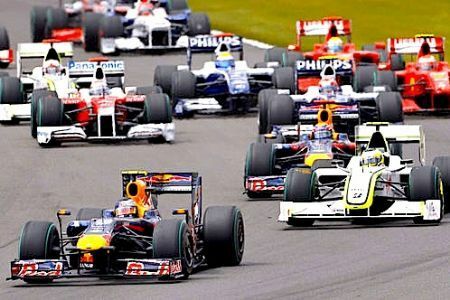 Yes, although only able to finish behind Sebastian Vettel won the race, but Webber managed to secure the top of the standings. He is 14 points ahead of Fernando Alonso and Vettel. Webber admitted in no way disappointed. “I was not disappointed not try to pass it. I could try, but I just think the league. Besides, overtaking at Suzuka is not easy, “said Webber. “Most important is that I’ve increased the advantage in the standings against the other competitors,” said 34-year-born racer.